This is most definitely a statement cake. Perfect for evoking holiday cheer and emphasizing mangoes. We used Martha Stewart’s Coffee-Caramel Roll recipe as inspiration for this cake. We used the same cake recipe, but added lime zest, and brushed it with a mango-pit lime syrup. Then, decided to fill the cake with vanilla whipped cream and mango, and covered it with the same frosting. 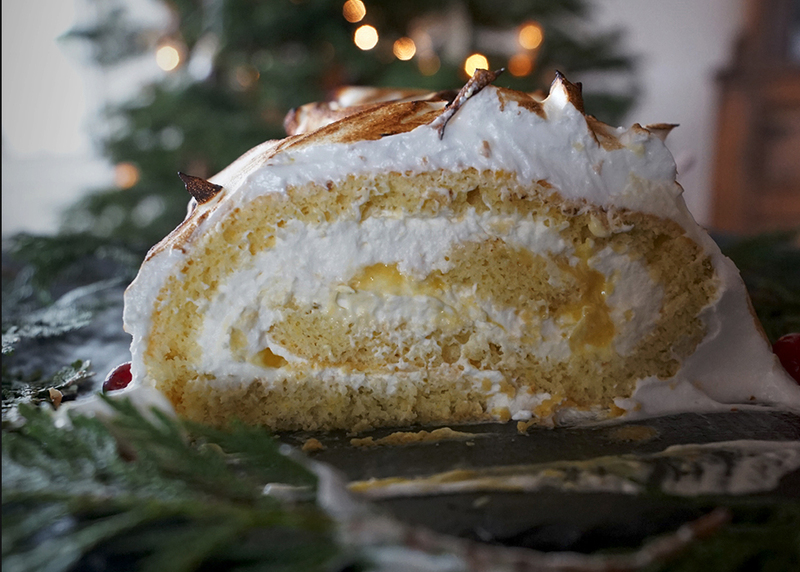 This cake can be enjoyed outside Christmas just as wonderfully. Pre-heat oven to 350 degrees F. Brush a 13 X 18 inch baking sheet with oil, and line it with parchment paper; brush the top of the parchment paper with oil as well. Mix together the flour, salt, baking powder, and lime zest. Whisk together hot water and sugar in a large bowl until the sugar is fully dissolved. Add the oil, egg yolks, vanilla and whisk until smooth. Slowly add the flour mixture and mix until combined. In a stand mixer with the whisk attachment (medium-low) beat on the egg whites until frothy (about 3 minutes). Add the cream of tartar and turn the speed up to medium-high and beat until stiff, glossy peaks form, about 6 minutes. Fold the egg whites into the batter gently until well combined, and no streaks of white are visible. Pour the batter onto the lined baking sheet and spread evenly using an offset (ideal) or regular spatula. Place in the oven and bake for about 16-19 minutes. It will be golden brown on the top, spongy, and pulling away from the sides. Cool on a wire rack for about 5 minutes. Lay a clean kitchen towel (thin material) flat on the counter and dust generously with powdered sugar. Flip the cake onto the towel and gently remove parchment. Face the cake horizontally in front of you on the towel and roll it up into the towel. Place the seam side of the cake down, and let rest (in the towel) for at least an hour, we left ours overnight. Place the ingredients in a small sauce pan and bring to a boil. Reduce heat and simmer about 15 minutes. Cool, strain and chill. Combine the mango, lime juice, sugar, salt and water in a blender, and blend until totally smooth and creamy. Make a double boiler by placing a small stainless steel bowl atop of a saucepan of a little water, making sure the bowl doesn’t touch the water. Bring to a boil and reduce heat to medium. Combine the mango purée and the egg yolks, and whisk slowly for about 8-10 minutes or until the curd becomes very thick. Take off heat and add butter, one tablespoon at a time. Cool and refrigerate at least 6 hours or overnight. Using a stand mixer or electric beaters; beat the cream, sugar and vanilla until soft peaks form. Unroll the cake. 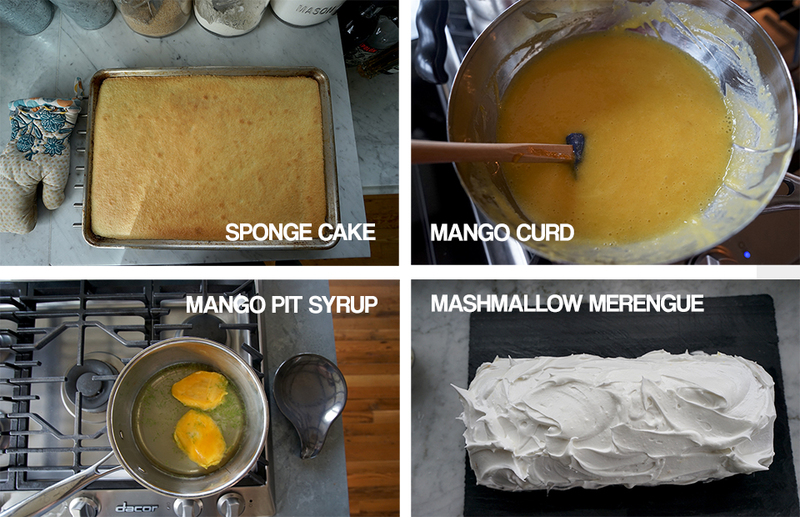 Brush the cake with the mango-pit lime syrup. Place the whipped cream evenly across the cake using an offset spatula, leave a little border around the entire cake. Next add a thin layer of the mango curd, evenly. Roll the cake up, the same way you initially rolled it up but without the towel. Gently place the cake seam side down on a serving apparatus that will fit inside the refrigerator. Also make sure the plate or serving piece can withstand some heat from the torch. Refrigerate about an hour before frosting. Place a little water in the bottom of a sauce pan and bring to a boil. Reduce to simmer. In a bowl that fits on top of the sauce pan (makeshift double boiler) whisk the egg whites, sugar and cream of tartar, making sure the bottom of the boil doesn’t touch the water, or it will cook the eggs. Continuously whisk for about 4 minutes or until the temperature hits about 140 degrees. We use a thermometer to be sure. Quickly and carefully transfer the egg white mixture to a stand mixer with whisk attachment and beat on high until stiff peaks form. This process will take 6-7 minutes for sure. 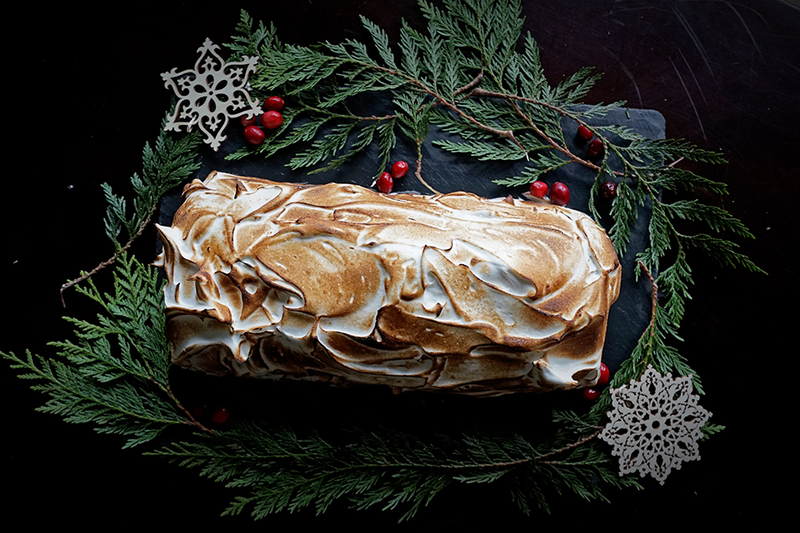 Remove the cake and frost it with the marshmallow merengue. Place the cake back in the refrigerator for up to 3 hours. Gently torch the cake using a hand held kitchen torch before serving.